Order the album from Amazon. These days there is considerable enmity and xenophobia in the U.S. and elsewhere, directed towards immigrants and those who look and think differently. In particular, “Dreamers” – the young Americans who were brought to the US as children – have been caught in the midst of this heated political debate. Having worked closely with Dreamers on arts related projects, I know them to be hard-working, intelligent-minded, country-loving individuals. It’s time that we see them not just as “Dreamers” but as Americans. And that’s why Huebner’s album is so important. He has created a soundtrack for the Dreamer movement and ultimately reveals more about their humanity. When we grow more familiar with someone, we don’t fear them as much. We can even become friends and family. Huebner thought carefully about the repertoire for the project and how to give this cause a musical voice. His album begins with Equinox, which is a through-and-through groove tune, arranged in a Cuban style, the famous John Coltrane number. It’s an opening salvo for how we can listen and learn from each other. The piece quickly opens into a solo section in which Huebner’s violin does the proverbial talking, cascading colorful lines and double-stopped notes into the more enigmatic piano feature performed by Klaus Mueller. Obsesión, a 1935 Spanish-language bolero, starts with an interlocking clave-based groove, over which Yumarya’s elegant voice sings the melody with great heart and spirit. Huebner fashioned the piece in the style of Jerry Gonzalez’s Fort Apache Band. This song is dedicated to maestro Gonzalez who passed away in 2018. The title track Los Soñadores is a stirring, bilingual cri de coeur that evokes the plight of the Dreamers: “We left the shadows behind us. We should never go back. My heart and my mind are screaming – Let me learn, let me grow, let me be!” This song may well become the anthem of the movement, both explaining and inspiring through rhythm and blues. The videographer Richie Briñez had the idea to create a music video dedicated to this song, and that’s where the message of this piece and album ultimately began. Cuban Blues features a more asymmetric 2/3 clave groove, paired with a hard-edged montuno that will make you shake your head along. Yumarya alternates between singing and speaking, as if to say “let me tell you how it is.” Such truth-to-power moments elevate this album even further as a statement piece. Para un Mejor Mundo (“For a Better World”) is an elegant duo that provides another emotional centerpiece for this album. It begins with swirling violin harmonics and a doubled-melody with Edmar Castenada’s harp, with a sparse rhythm section so that “emptiness” itself functions like another instrument. Zapato Apretao (“The shoe is tight”) is a mirthful tune with Karen Joseph’s lively flute solo over rolling timbales and crash cymbals. A very fine arrangement that weaves the music of Cuba with modern jazz touches. This piece harks back to Huebner’s performances with Johnny Almendra and Los Jovenes Del Barrio in the late 1990s at Gonzales y Gonzalez, a Mexican restaurant featuring live music in Lower Manhattan. Here they performed songs in the Cuban charanga tradition. “In Johnny’s band we played modern charanga, and he always hired more modern arrangers like Joaquin Betancourt. It was a fun time,” said Huebner. Llanto de Luna (“The moon is crying”) and South Sudan bring out the best of Huebner’s ability to blend his wizardly playing with inventive compositions and refined arrangements. He inhabits these songs fully, with his inspired performances. Indeed, his solos bear authenticity, borne from how deeply he feels about these young Americans. His music is that of empathy, opening our hearts and minds to the struggles of those among us. Yoruban Fantasy, the penultimate piece featuring Yoruban group chants introduces a collective aesthetic (with electronics written by Huebner and Jerome Goldschmidt), as if to say, “we all have to join in the movement to create the change we want to see.” The rhythm that Huebner plays on the violin come from the batá drums. 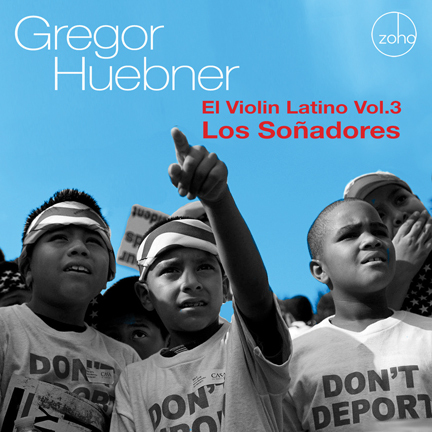 The last tune Buey Viejo (“Old Ox”) comes from Huebner’s first El Violin Latino album and features the unique voice of Cuban born, New York domiciled poet Mappy Torres. “Without her, this whole idea of the El Violin series would have never come to life. Thank you, Mappy, for your great spirit and wherever you are – I hope that this music makes you smile,” said Huebner, who dedicates the album to her memory, as she passed away in 2018. It has been a pleasure to produce this album with maestro Huebner, one of the most glittering and virtuosic violinists of our times. Huebner has delivered an album that is more than worthy of its moment, something that speaks not to just what’s going in the world, but what how we can affect positive change in it. And for this, I am grateful that this maestro-turned-activist is in our midst. Kabir Sehgal is a New York Times bestselling author and Multi-Grammy & Latin Grammy Award winning producer.